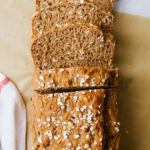 Made with whole grains, spiced with cinnamon, allspice and nutmeg, and naturally sweetened with pure maple syrup and applesauce, this applesauce bread is moist, delicious and pairs perfectly with a cup of tea or coffee anytime of day. Preheat oven to 350 degrees F. Lightly grease a 9 x 5 loaf pan with oil, or line with parchment paper. In a medium/large mixing bowl, combine the flour, oats, baking powder, baking soda, cinnamon, allspice, nutmeg and salt. Add the applesauce, maple syrup and milk to the dry ingredients and mix until just combined. Don’t overmix. Pour batter into prepared loaf pan, optionally top with a small handful of whole or quick oats, place pan in oven and bake for 55 minutes. Remove from oven, let cool and store covered for 4 days. To keep longer, store in the refrigerator for 2 weeks or in the freezer for up to 2 months. Since this bread doesn’t have much fat, it has a slightly chewy texture. If it bothers you and you don’t mind oil, feel free to replace the non-dairy milk with oil.